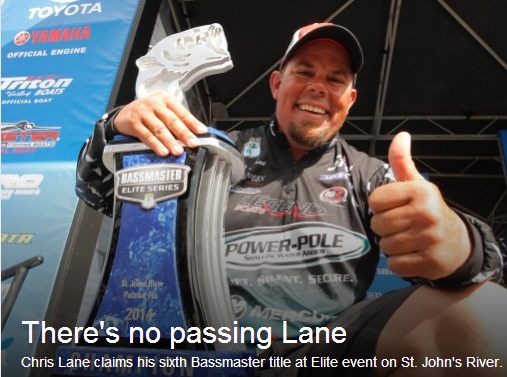 Chris Lane brought in 15-0 today to win the Bassmaster Elite Tournament on the St. Johns River. Lanes total weight was 90-13. Lane said he caught his fish on black & blue worm & a black & blue Senko style stick bait. At around 0830 Lane had a boater purposely run thru an area that he was going to fish. Lane just shook his head & moved to a different location. Lane only needed 15 ounces the last day to win the tournament. Dean Rojas weighed in 21-10 today to finish 2nd and occupied the “Hot Seat” until Lane came up on stage. Chris Lane mentioned that he’d much rather win $100,000 than be in the century club with anglers weighing in over 100 lbs during a tournament. Lanes win automatically gives him a berth in the next Bassmaster Classic. Lane is definitely a force to be reckoned with. Lanes favorite expression is “POW”. It fits him because he sure knocked their lights out during the event. Congratulations Champ. You did it again.